Kazue Mizushima, a composer, formed Studio Eve in 1992 with Midori Yaegashi and started to create STRINGRAPHY works. 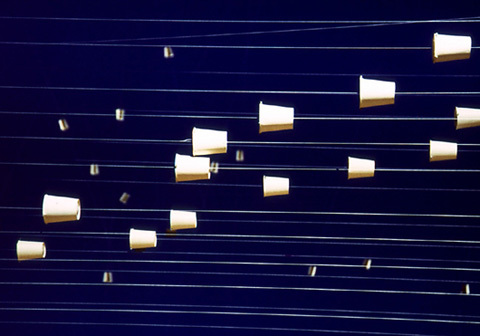 She created indoor sound installations that utilize a multitude of "string telephones" (silk threads attached to paper cups). These installations transform the entire performance space into an immense acoustic "harp" whose strings of criss-crossing thread create a geometric web where both performer and audience become part of the resonating chamber. Studio Eve has focused on works for Stringraphy Ensemble since 1996. Three to five performers play a wide variety of musical repertory including original pieces, Gagaku - Japanese ancient music, Western classical music, Popular as well as Contemporary music. Kazue Mizushima and Stringraphy Ensemble have been invited to perform at museums in Japan and abroad (including Takamatsu City Museum of Art in Japan and ARKEN-Museum for Modern Art in Denmark) and has participated in many international music and art festivals (including Sound Culture in the USA and World Music Days in Denmark in 1996). These projects were supported by Japan Foundation, The Japan Arts Foundations, EU Japan Festival, Scandinavia-Japan Sasakawa Foundation. In 1996 Kazue Mizushima received awards for STRINGRAPHY '96 from the International Society for Contemporary Music (ISCM) at "World Music Days '96" (the world's largest contemporary Music festival) and performed at ARKEN-Museum for Modern Art in Denmark. "Mizushima is an installation sound artist, which is a fancy way of saying she builds her orchestra using the space provided." -Robert Everett- Green, The Globe and Mail, Toronto, Canada on a review of her performance at the Music Gallery in Toronto, Canada.